In 2009 two colleagues and I got permission to make an experimental “pocket prairie” on about 3,000 square feet of campus lawn. We coupled a minuscule budget with an aversion to pesticides, so instead of “nuking” the grass, that December we seeded into the frozen, live sod. (Most prairie seeds need a period of cold before germinating in warm weather.) I had read somewhere that this approach could be taken—had been taken at the University of Wisconsin Arboretum. The next spring we mowed, and added some small plants we’d either propagated or ordered from a native plant nursery. All summer we searched for signs that our seeds had germinated, but they took their time: for a couple of years it seemed as if the turf grass and non-native weeds would win out. Gradually, however, through continued care, over seeding and planting, and a yearly early-spring mowing, the area thrived. Tall, strong prairie plants have mostly shaded out the turf grass. Bird and insect life proliferates, even though the place remains a tiny island in a chemically treated sea of lawn bordered by parking lots. Even endangered Monarch butterflies have shown up in increasing numbers to sip nectar and lay eggs on the four species of milkweed. The early challenge posed by weeds continues, though less than the first couple of years. Incursion by aggressive species (aka opportunistic, early successional annuals and perennials) would, if not controlled, soon dominate the prairie garden, as we call it. Of the approximately 2,500 species in Cook County, Illinois, about half were not present prior to European settlement and are considered non-native. Of these, a relatively small number have the ability to reduce biodiversity where they grow and are considered invasive. Thus, in the prairie garden, Canada thistle, white sweet clover and perennial sow thistle appeared in successive years, followed this year by crown vetch, and, because of their natures, soon became too abundant for good balance among species. There are no “bad,” or “evil” plants, and these do have some value for pollinators. For example, some pf the clover honey available in stores comes from this species of clover. However, each of these plants has the potential to shade and crowd out the slower to establish and grow prairie plants, quickly and decisively becoming a near monoculture. How to manage them? 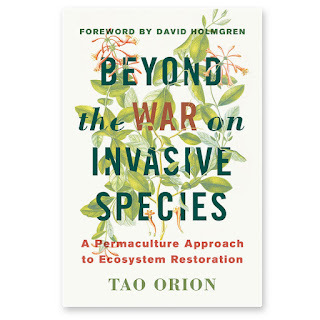 It is this kind of dilemma that Tao Orion’s “Beyond the War on Invasive Species: A Permaculture Approach to Ecosystem Restoration” (Chelsea Green Publishing, 2015) approaches head on, with smarts, honesty and the authenticity that comes from lived experience. Orion, who holds both a degree in agroecology and a permaculture certificate, manages a 6.5 acre smallholding with her husband. She also teaches at the University of Oregon and is on the staff at a non-profit sustainable living institute, Aprovecho. She knows whereof she speaks. Her book is a worthwhile entry in the ongoing discussion about how to carry on the very real and most urgent tasks of ecosystem regeneration in human-occupied areas, which is to say nearly everywhere. She criticizes the vocabulary and approach of the field of invasion biology, which, according to her, is ideology driven, demonizes non-native species and features an increasing reliance on toxic pesticides to eliminate invasive plant species in natural areas, which in her view repeats the mistakes of industrial age agriculture. She proposes that healthy ecosystems more readily resist aggressively opportunistic species; instead of treating symptoms of extreme disturbance using extreme measures, we should look at the larger causes that enable invasive species to take hold, begin to remedy those, and while we are doing so, adopt management techniques drawn from permaculture ideas and practices. What we would be left with would be human-managed ecosystems that might not necessarily duplicate those that existed pre-European settlement and would include not-historically-native species—but would be healthy, diverse and well functioning. In this context Orion begins from first permaculture principles: care for people, care for planet, reinvest the surplus, and turn problems into solutions. She presents case studies of ecosystems where invasive plant species have taken over from natives and recounts the moral language used about these plants and measures, often violent, used to extirpate them, often without success. For example, Orion analyzes the problem of tamarisk (salt cedar) trees along the Colorado River, their displacement of willows and cottonwoods and how land managers have tried to eradicate the tree without addressing what it is about the ecosystem that favors the invasion: in this case, the nearly nonexistent river flow owing to human urban and agricultural use. Salt builds up, water is reduced and a salt-loving species such as tamarisk is bound to be ecologically favored over the water loving, less salt tolerant natives. She makes the very good point that it is human development and control of the river, including the siphoning off of all of its water before it reaches the delta and the Gulf of California that are the real problems. These new conditions disfavor the historic plants but favor the salt cedar for good reasons. More reasonable, at least from an ecosystem’s—or the willows and other historic species’— point of view would be to change river management such that water flow would bear some resemblance to historical norms. Because Orion is a permaculturalist, she naturally thinks about ecosystem management in terms of benefits to humans. The book is packed full of examples of how weedy plants could be turned to better account. A great example of this is the lowly ailanthus tree, or tree-of-heaven, with which almost everyone is familiar and almost no one loves. One reason we have them in the US is that the ailanthus silkworm produces a fiber reminiscent of a cross between silk and wool. At one time there was a thriving “ailantine” textile industry in the US and other parts of the world, which ceased when cotton gained dominance. Similar to the argument proponents put forth in favor of hemp, she proposes resuscitating an ailantine production sector. Like hemp, ailanthus trees can grow on marginal land and in unfavorable situations and do not require the fertilizer and pesticides needed in industrial cotton farming. As she says, “cultivating tree of heaven for fiber helps mitigate climate change, reduces pesticide use, remediates heavy-metal-laden soils and has the potential to create economic outcomes for people living in invaded ecosystems.” She has similar ideas for kudzu, scourge of the southeast. In some ways, however, Orion goes too far in her rehabilitation of invasive species and the claim that healthy ecosystems can resist them. Certain species actually do exist that rampage through even healthy ecosystems for which controls must be found. Midwesterners continue to mourn the ash trees, now replaced on urban parkways and lingering as ghosts in the woods, which succumbed to the emerald ash borer, the seemingly unstoppable pest from eastern Eurasia. In the case of the ash, Orion says that suboptimal rain in the Eastern US weakened millions of them: fully healthy trees would not have died. Unfortunately there is more to this story. American ash lack the EAB-fighting chemicals that Chinese ash possess owing to coevolution. In China, for example, healthy American ash trees die, while Chinese ash species do not. What is to be done? On the other hand, Orion’s larger point, that we should manage ourselves and our ecosystems to maximize biodiversity while also helping ourselves, is well taken. Having spent much time clearing Eurasian buckthorn from oak woodland savannas over a period of fifteen years, I have witnessed how control allows assemblages of native plants to flourish. At the moment, buckthorn is chopped down and burned and the stumps herbicided. I’ve long thought better use could be made of the wood. Perhaps licenses could be given to people to harvest and put it to good use, whether as fuel or for crafting—it is good, sturdy wood, after all. A pity to waste it. Another slight caveat I have is Orion’s apparently somewhat romanticized ideas about indigenous peoples’ land management practices. For excellent reasons, the myth that prior to 1492 the US was a pristine wilderness has been dispelled; now, partly in reaction to our own bad management practices, an idea has taken hold that ancient indigenous peoples always managed the land better than we do. Yes, many pre-modern and non-western cultures have much to teach about useful methods, and perhaps even more importantly, about maintaining right relationship with the natural world. Yes, the peoples that would later be called Native Americans managed the continent on a vast scale through strategic burning, cultivating wild plants and trees within wild settings and practicing garden agriculture. In many cases this led to increased biodiversity, including an abundance of game and plentiful food crops, and Orion’s examples are both evocative and to the point. The prairie and woodland savanna landscape I love was created through this kind of management. However, it is also important to remember a few other facts that temper the record. Certain practices such as prehistoric mass bison kills would not look sustainable to us. The Anasazi and Hopewell cultures both collapsed partly for environmental reasons, including, in the city of Cahokia’s case, overpopulation and agricultural degradation. And in central Mexico, Aztec overpopulation resulted in overuse of the land, evidenced by the marks of widespread erosion that occurred prior to the arrival of the Spanish. More generally speaking, while what was to become the US was certainly more populous (50-100 million) prior to European incursion than previously believed, that many people living an ecologically friendly, land-based lifestyle within a much larger matrix of ecosystems is vastly different from 350 million or so employing ecologically disastrous methods to supply our wants and needs. Clearly, though less populous than many other countries, from an ecosystem point of view, even the US could be considered overpopulated. Looming over this book, and over all questions and ideas about how to manage land so that not only people but all the other species—plants, animals, lichens, fungi, and all the denizens of the several microbiomes—can thrive, is the overwhelming fact that we have indeed entered the Anthropocene—the age dominated by humankind. Debate continues about when it began. To Orion’s point, a recent article in PNAS demonstrates through a review of evidence that we’ve been altering ecosystems for 13,000 years for better and worse. Also, while we have a right to be here, and are capable of managing ecosystems in beneficial ways, it seems irrefutable that other species need room too. Globally, our one species is taking up space and eliminating suitable conditions for the other 2 million named species and 6 million potentially to be found and named. For them there must be large areas of good habitat. Orion recognizes the need to restore ecosystems and manage our land in such a way that certain species of plants that are overly opportunistic in certain contexts can be managed and controlled. She gives a number of useful recommendations that range from eminently practical to “if only it could happen” scenarios. Yet she doesn’t fall into the opposite, gung-ho Anthropocene “nature is dead and we might as well get used to it” camp, and for that I thank her. At this point, we can’t stop the ongoing reshuffling of ecosystems. Too many factors are stacked against us to return to some version of the past, whether we view that past as mostly wilderness or mostly beneficially managed through indigenous peoples’ activities. Yet large, intact ecosystems with defining characteristics do persist. And land management, and the ethos that defines it, is already changing, as evidenced by books like this one. What needs to be changing even faster are the social conditions and the inexorable civilizational logic that create environmental chaos in the first place. Recently, I learned a new term: “moral injury.” This is what soldiers suffer when they return from war, having been required to take part in or helpless to prevent morally repugnant actions, or having seen terrible things they couldn’t help, such as the killing of children and helpless civilians. These lie outside their identity as moral beings and they can’t forgive themselves. Though symptoms can be similar to those of PTSD, moral injury is different and creates deep-seated, lasting emotional wounds, with unrelenting feelings of guilt, shame and despair. There are a number of therapies, some of which are psychiatric, but also spiritual and meditation-based. Strikingly, something that seems to help is being out in nature and learning again to experience the beauty of the earth. I mean no disrespect to the vets who have undergone such terrible experiences and live with such debilitating results; but in thinking about the term itself, I wonder if there can be another form of moral injury that arises from the way our society clearcuts forests, plows prairies and pollutes the air and waterways. I have read many texts in which the writers mourn the old landscapes and feel guilt, shame and responsibility that they didn’t or couldn’t do more to preserve them. Perhaps our industrialized society is staggering under a huge load of this kind of moral injury regarding our treatment not only of people but also of the ecosystems that support us. Perhaps climate change deniers, in effect, are denying their own debilitating moral injury. Perhaps, however, it is most acutely felt among people most in tune with their home ecosystems and among those seeking to help our dominance become less ruinous to other species. I believe that being out in nature helps. Practicing reciprocity—giving back to nature what we owe—helps. How do we replace a societal ethic of relentless growth with one of nurturance and restraint? If enacted on a wide scale, land management of the sort Orion is advocating, along with other forms of reconciliation ecology, has the potential to help cure this societal sickness through the restoration of ecosystems. “Beyond the War on Invasive Species” is a good example of the new ecological theory and practice that is manifesting in multiple arenas. Meanwhile, here in the prairie garden we keep planting and observing. As I write, yesterday I was cutting back white sweet clover. It is nearly as tall as I am, but then so are the liatris, prairie sunflowers, the cup plants and compass plants, common milkweed, grey-headed coneflowers and so many others. The flowers are mostly at eye level, and the warm-season grasses will overtop them all next month. Plants cover every square inch of ground. Wading in among them to cut the clover, green growth pressing on every side, bees and butterflies pollinating close by, is one good way to experience living nature, Midwest version, in its sun-powered, midsummer exuberance. I’ll never eradicate the weedy plants, but neither will they take over. I’ve discovered that cutting back thistle when in flower to a height of six or eight inches helps knock back the population, as does cutting sweet clover while in bloom but before it sets seed. There are, besides, native plants that can hold their own against opportunistic weedy plants. For example, fast-growing cool season native grasses such as switch grass are reputed to be able to stand up to crown vetch’s suffocating embrace. I’ll plant some soon and see how it goes. Many thanks to reader Margaret F-H for suggesting this book. Note: Posted at the end of a horrific week of gun violence in the US. When will we ever learn? We have been out with our first hack group. In the Silvermine part of Table Mountain National Park. We were removing Australian black wattle. The middling ones cut and poisoned with herbicide. I preferred to pull the small ones. And we plan to get our own tree popper for the saplings. What we cut was left in heaps to mulch and compost down. Wattles and Eucalyptus are being cleared and turned into firewood, both informally by solitary woodcutters, and formally (the load of wood delivered for our closed combustion stove) Now in winter the National Parks are burning heaps of small stuff. Thanks for this review!! I like the author's mindset as I'm uncomfortable with all the herbicide use but some suggestions are a bit "pie in the sky". I somehow can't picture someone strolling through the woods in back of us and making even a small dent in harvesting all the garlic mustard there. Even my goats were not too fond of it in early spring. That's the time when they were dying for some green goodies. They'd just nibble a bit at the young plants. Still her thoughts and opinions are important additions to the discussion as to how to deal with invasives. Thank you for reviewing that book. It has many good ideas and obviously as you point out some are a bit ideological too. Down here we are sort of locked down into a doing nothing sort of an approach which is yielding disastrous consequences over and over again with massive wildfires. The book that you reviewed challenges a very culturally pre-programmed notion of what an ecosystem should look like. It is very difficult to challenge this. I plant willows in my swale and suddenly I'm like public enemy number one! Go figure that out. I simply get on with the job at hand and try not to upset anyone as they are easily offended down here on such matters. It is complex. I enjoyed an excellent book recently which explored the historical land management practices of the Aboriginals through referencing painting and first hand accounts (from reputable sources) of what the ecosystem looked like and how did it work. It was fascinating reading and it tells a very different story from that of today. Adrian states, "For excellent reasons, the myth that prior to 1492 the US was a pristine wilderness has been dispelled..."
Great news that your town has a conservation association and that you are on it. Your gardening expertise is welcome, I'm sure! I hope you enjoy the book. It's quite thought provoking. Yes, I've been reading about South Africa's effort to restore the landscape on a massive scale. Part of the excellent "our Once and Future Planet" discusses the whole program. I'm glad to hear you're part of it. I think you'd have to have an army of foragers to properly deal with garlic mustard. Interesting about the goats. I thought they'd eat anything. Yes, I agree, the book is worthwhile, and could provide fruitful discussion for a lot of groups engaged in restoration and conservation. Thanks for stopping by. On my own property, my approach tends to be to work with native plants first, if at all possible, since there are a lot of ecosystem interactions that depend on them. for example, are there native Australian water-loving shrubs and small trees that would be appropriate for your swale? On the other hand, willows might be best. Not knowing Australia, I wouldn't know. Are you referring to "The Greatest Estate on Earth"? Another eye-opening book, that. I do get your point about do-nothing "management" leading to disastrous fires--it happens out west in the US. Here is Illinois we use prescribed fire quite a bit in out natural areas. Thanks for the quote. "1491" is a fascinating book. I do think, though, that there is sometimes a rush to import plants for purposes that natives would serve just as well or better. Sometimes there has been an undervaluing of plants and ecosystems native to the Americas. Attempts to destroy Native American cultures have gone hand in hand with destruction of the ecosystems they have called home. Very helpful review, Adrian - thanks! It will be interesting to see how your 'pocket prairie' continues to evolve, successionally, over time. Thanks! I'm not sure is is or will be successional, in the normal sense of the term, since it is an artificial planting. It has been interesting to see the ebb and flow of species, depending on conditions (dry years favor some, wet years others). Also it's been interesting to see how certain plants spread and pop up in areas far from where we planted them. And others have declined, of course.